Saturday, August 9th Porsche racing legend Hurley Haywood will be at the Petersen Automotive Musuem to sign autographs and participate in an in-depth interview with MotoMan Studio. Joining Hurley for the event will be the Porsche 919 Hybrid LMP1 car that's currently on display in the Concourse Gallery of the museum. The event itself is free with paid admission to the museum, you just need to RSVP to sscott@petersen.org or (323) 964-6370. Be sure to RSVP quickly if you want to go as there is limited space and it's sure to go fast once word gets out. In addition, ust prior to the event, from 9:00 a.m. to 11:00 a.m., is a free Porsche cruise-in open on the 4th floor of the Petersen Automotive Museum parking structure. No RSVP is required for this portin of the event and it's open to the public. Enjoy! The Reliable trucked pulled up around 7:15pm. Once the car was off the truck, we knew it would be a long night. Ground clearance was the name of the game when it came to moving this German beast. Porsche probably never pictured a Jeep as a tow car either. The hybrid race car was taken to the 2nd floor of the museum, where it’s currently on display. After a few hour of head scratching, the Porsche was ready to be unwrapped. This might as well have been Christmas. Once the protective wrap of off the race car, they realized they're were not out of the woods yet. 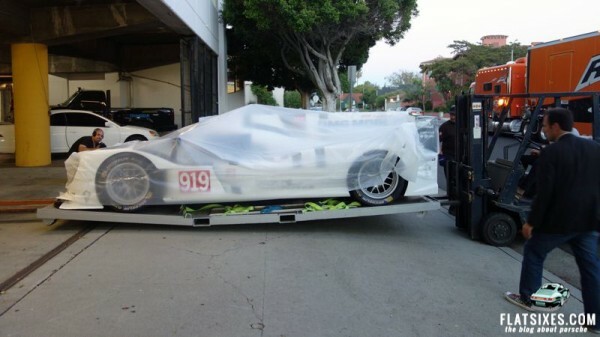 The Porsche 919 still had to be rolled off its platform and put in place. By 10:15pm the Le Mans racer was tucked in and put to bed. It will be at the Petersen Automotive Museum on display until Saturday. After that, it heads straight to Pebble Beach where it hopefully will be placed on the ground floor. Special thanks to Car Stories for the story idea, pictures and captions! The Brumos Driving Experience. What is It and How Can You Attend? Motoman said Hurley won LeMans more than anyone; he is way incorrect; Hurley won it only 3 times. Tom Kristensen has won it 9 times, followed by Jacky Ickyx at 6, Then Derek Bell, Frnak Biela, and Emmanuele Pirro at 5 times each. Kristensen also holds the record for most consecutive wins at 6.